Lantern acquired in June 2008. This lantern came from somewhere in Derby City Centre, although I'm not exactly sure where this was. 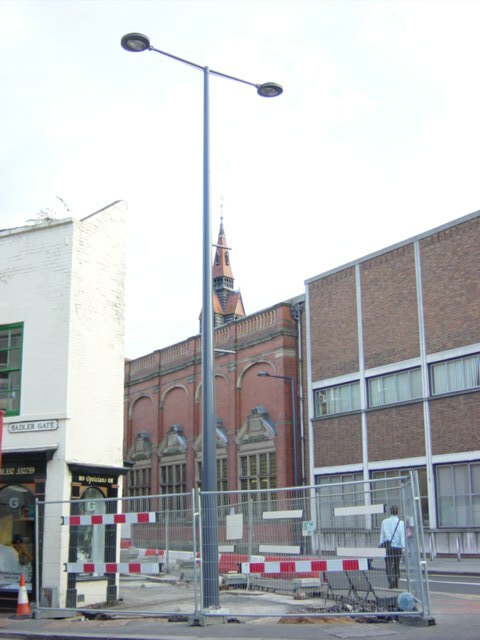 The Elipts were chosen to re-light many streets in the City Centre in 2003 as another part of the 'Connecting Derby' scheme. These lanterns are rare in the UK - they are more readily spotted in their native France.
" 'The chances of anything coming from Mars are a million to one', he said!" The lantern is obviously an alien craft in disguise...the disguise being the small feather at the front of the canopy! The lantern's angle to the road can be adjusted by loosening the ratchet cylinder to the right of the canopy. Five degrees is the usual setting, however this lantern appears to have been accidentally set to minus five! The canopy is held in place by three three toggles, which appear to be very similar to the type used in many old Phosco/Phosware lanterns. The gear just about manages to squeeze in alongside the reflector, but even so, it's a close call! 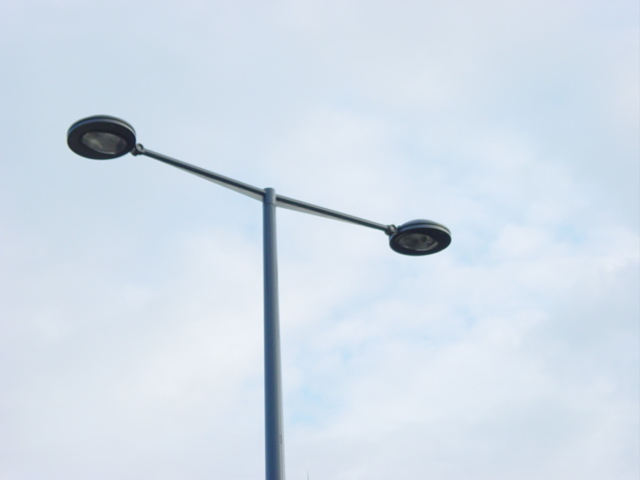 The two photographs below show a double-arm column, with both brackets supporting Elipt 55 lanterns. These photographs were taken in Derby City Centre in 2003, shortly after the column was installed (notice the safety barriers surrounding the unfinished new paving).